Before I can explain my TimerTriggerBehavior I first have to re-introduce my Behavior<T> class which I use as a base class for all my behaviors. The TimerTriggerBehavior class is derives from this Behavior<T> class and contains DispatcherTimer. It has a MilliSecondsPerTick and IsEnabled properties. The MilliSecondsPerTick property is used to set the Interval of the Property. The IsEnabled property is used to start and stop the timer. It is an DependencyProperty so you can DataBind it. In Tick event is subscribed in the OnAttached() method and unsubscribed in the OnDetached() method. The Timer_Tick() event handler calls the Execute() method which invokes all triggers. The class also contains an Actions DependencyProperty and a Execute() method and the class is decorated with the ContentPropertyAttribute. 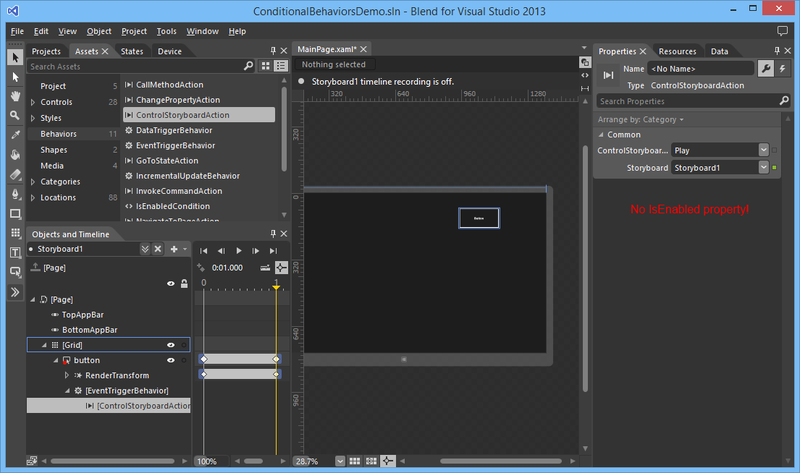 This will be used by Blend for Visual Studio to allow Drag&Drop of Actions onto the Behavior. /// Get or Sets the IsEnabled dependency property. /// Identifies the IsEnabled dependency property. The SwipeTriggerBehavior has a Direction property which you can set the swipe direction which will trigger the Actions. The ManipulationCompleted event on the UIElement is used to detect the swipe gesture. The ManipulationCompletedRoutedEventArgs.Velocities.Linear.X and Y are used to check the direction. I use this Between() extension method to check it is between 0.3 and 100. These values work for me but maybe not for you. Maybe I should make these flexible using properties (next version). This class also contains an Actions DependencyProperty and an Execute() method. Just like the TimerTrigger. I have tried to place them in an abstract base class TriggerBehavior<> but that caused problems in Blend. You couldn't drop an action on the Triggers deriving from this class. So I have chosen to have some duplicate code. To demonstrate these behaviors I have written this 'Triggers Demo' project. 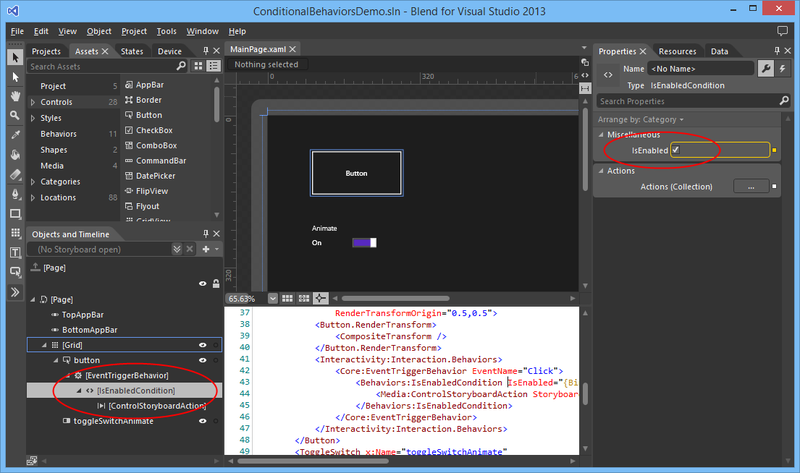 I Blend for Visual Studio I have dropped a TimerTriggerBehavior onto the root Grid element of the MainPage. On the TimerTriggerBehavior I have dropped a PlaySoundAction. The Source of this action is set to a Click.wav which I added to the \Assets\Sounds folder of the project. The Grid also contains a ToggleSwitch. The IsOn property is databound to the IsEnabled property of the timer trigger. The result is a Page in which you hear a click sound play every 2 seconds. You can turn the sound off using the ToggleSwitch. If you swipe the blue box the swipe direction is shown in the center of this box. I hope you like my solution. Feel free to use it in your projects. You can download the sample project below. 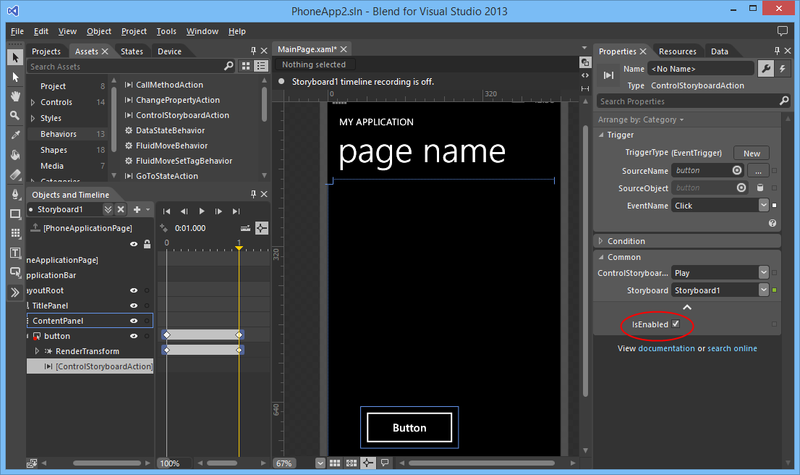 What’s new in XAML and Tooling for Windows 8.1? 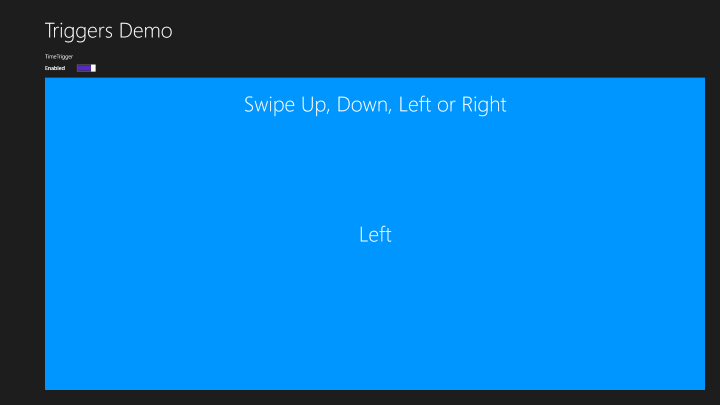 The XAML used for this demo. I hope you like my solution. 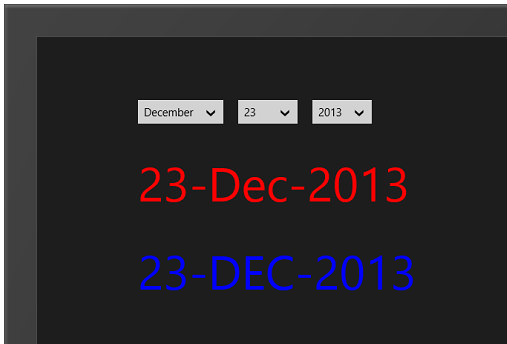 My demo is writen as a Windows Store app but you can also use it in Windows Phone, Silverlight and WPF. You can download my code below. A have written a simple class called IsEnabledCondition. This class implements the IAction interface which makes it an Action. It has two dependency properties: IsEnabled and Actions. The Actions property is set as the ContentProperty using the ContentPropertyAttribute on the class. The Execute() method only executes the contained actions when the IsEnabled property is set. I learned this ActionList from reading Mark Smith Behaviors in Windows 8.1 Store Apps blog post. I use this action as the parent of my previously used ControlStoryBoardAction. The IsEnabled property is databound to the IsOn property of the ToggleSwitch. Databinding is possible because the IsEnabled property is an Dependency Property. If you start the application you can click the button it moves to the right and then comes back. If you turn the 'Animate' switch Off an then click the button nothing happens. I hope you like my solution. Maybe you can use it in your apps too. I plan to write many more conditional actions so check out my blogs for more posts. You can download my code below.